FK Senica focuses its attention in a significant way on the youth as well. It is not only a young talented footballer, but also targets schoolchildren, non-footballers. As part of the new Children's Future project, the world of professional football wants to make the world's smallest. The project is being developed in cooperation with the elementary schools in Senica district and in the whole region of Záhorie. The first project was a two-hour competition for pupils III. Senica Elementary School in the Municipal Sports Hall in Senica. Within the framework of the Children's Future project, FK Senica will attend the partner primary schools in Záhorí and a joint lesson, two will make the pupils more pleasant and will bring life to life. During the visit, pupils can enjoy interesting competitions, enjoy themselves with the smiley stories of FK Senica footballers, treat them with anything about them, but also get a piece of football skills. Professional football fans of FK Senica will show pupils something from their repertoire. The FK Senica LELE mascot will end in the roll. The event culminates in the signing of FK Senica footballers or in joint photography. The partner school joining the project will receive a 100-ticket gift from the club for a selected home match of FK Senica within the Corgoň League. Why the project come into being? Children and sport. This has been a matter of course in the past. Times change, and new trends and hobbies of our next generation are linked. 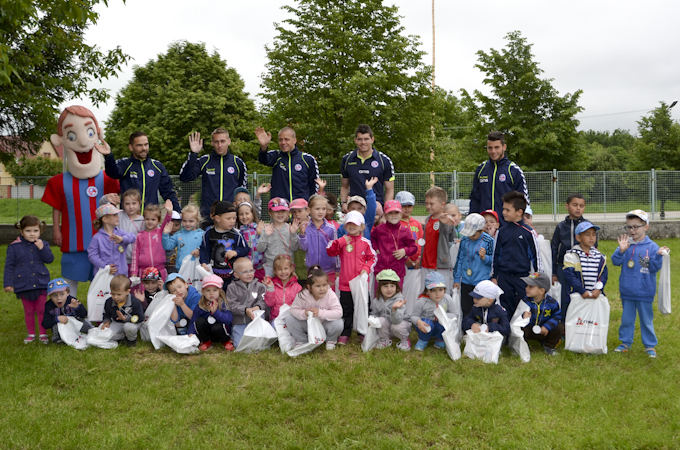 FK Senica's goal is to show that football is a sporting phenomenon and motivated to attract children to green lawns. We want to show children, in a nonviolent and attractive way, that it makes much more sense to spend free time on the playground or outdoors in front of the house on a "slice" than in computer games or television. Through a series of activities in cooperation with FK Senica - school - pupils we also want to build a positive relationship with sport and fair play. Each school visit will also serve as an invitation for football children. The school will receive 100 or more football tickets from FK Senica. The children will take care of FK Senica animators throughout the game, which will help them in the animation and match choreography. FK Senica will provide one bus for each school free of charge. FK Senica will gradually reach all elementary schools in the Senica district, later in the entire region of Záhorie. If you have not received an invitation to join the project, just write to fksenica@fksenica.eu and we will contact you.